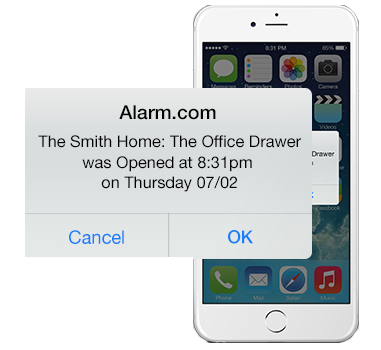 Experience the best of smart home technology with an Alarm.com powered system. Using the most reliable and secure communications and advanced tamper-resistant technology, you can rest assured your home will stay protected. Using the most reliable and secure communications and advanced tamper-resistant technology, you can rest assured your home will stay protected. Dedicated Communication – Even if the phone line is damaged, the power goes out, or the internet is disconnected, your system always works. Exclusive Crash & Smash Protection – Your system will continue to work even if the security panel is damaged or the phone line is cut. See what’s happening at your property in real-time, get instant alerts with Smart Clip Capture, and never miss a moment of continuous recording with Video Monitoring. With best-in-class equipment, you’ll never miss a thing. With your Alarm.com powered system, you can check in anytime, arm or disarm your system remotely, and receive notifications—all while on the go. You can also check on other connected devices including lights, locks, thermostats, and garage doors. Instant Alerts – Get real-time notifications by push notification or email the moment something happens in your home. Personalised User Codes – Create unique user codes to know who’s coming and going at all times. History – Look back at activity over time or easily search for specific events. In a Smart Home Security system, the sensor's role is far greater. Their status (open or closed) can generate real-time smartphone alerts so you know when a door is opened around the home. These alerts are easy to customize, so you can set them up to get exactly the important information you want. For example, you can get an alert if a window is open when you go to bed, or if you leave home without closing the back door. Our uniquely connected network of sensors and devices not only detects dangerous situations, but takes proactive, automatic measures to protect your home and family.